I get some really great questions from you guys. I appreciate the emails you send me and I try to answer them as quickly as possible. I’m not a nutritionist or personal trainer, so I cannot give specific advise but I am always willing to share what worked for me. You can email me, tweet me, message me on Facebook or leave a comment and I’ll try and answer your questions. I wrote a post awhile back about how to use a Polar Heart Rate Monitor. It’s the one I use and the one you guys see here frequently. Check out that post for a little background and explanation on how it works. The background on my HRM is this: I did not have one while I lost my 100 pounds. I got my calorie burn from the machines at the gym (inaccurate) and a website that I used where I put in my age, weight, activity and length of time and it calculated the burn for me–also inaccurate. It wasn’t until I was dating Michael that I even knew the HRM existed. He bought me one for my birthday and it changed EVERYTHING. First, I could be much more accurate in my calories burned. I’m sure that has been a HUGE help in keeping the weight off. Second, it’s pretty motivating to see a number for my efforts. This helps by making me feel accomplished and by keeping me motivated when I hit a slump during a workout. The best thing about a HRM is that it changed the way I worked out. Not only did it teach me how to run properly (i.e. pacing, not “running as fast as you can as long as you can”), but it taught me what activities burned what. If I wasn’t working HARD enough, my watch told me and I pumped it up. To answer the reader’s first question: Yes, the fitter I got, the less I weighed, the less calories I burned. To give you an example, I’m about 145 pounds and Michael is somewhere around 182 and about 6 inches taller then me. I’m also a bit fitter than him. When we do activities together (biking or hiking) he usually burns 20-30% more calories than I do. One of the benefits of using a HRM when I had to stop running after an injury was that it proved to me that lifting weights WAS a good workout. Before that I scoffed at the idea. I hate lifting weights, it was slow and boring, and I thought I didn’t burn the same as I did running. I was so wrong. Using my HRM I learned how to workout smarter and that has helped me a lot. To answer the second question about focus…I think it depends on what your goal is. 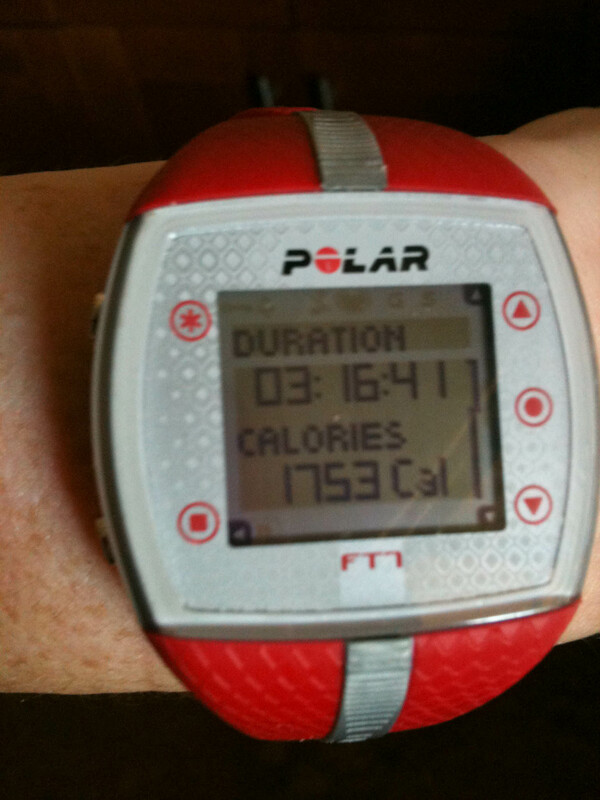 Focus on the number of calories burned? Focus on the fitness? While I was losing the weight, my focus was 100% on calories burned and weight lost, obviously. Once I was at goal weight, my focus changed. I wanted to get stronger and more efficient. When I was running I wanted to be FASTER and I wanted better recovery. With cycling, I want to be conditioned to bike longer. With weight lifting I want to see my body toned and stronger. It’s all relative to what you do. I highly recommend buying a heart rate monitor. There are a ton of different brands and styles out there. You can spend less than $100 and get a good model that will improve your workouts. QUESTION: Is your focus calorie burns or fitness?